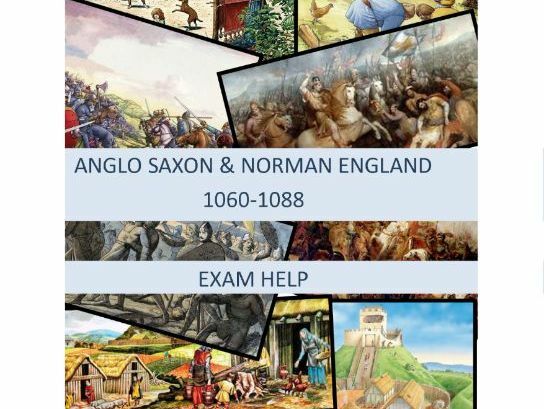 With revision well underway now for Year 11 pupils we have prepared a selection of history revision materials to help you keep learners engaged and revising either with you or independently! Check out this sample of guided revision booklets that students can work through, revision games to revive students at the end of a long school day and knowledge organisers to help learners condense lengthy topics and exam papers down in to bite-size, revisable chunks. 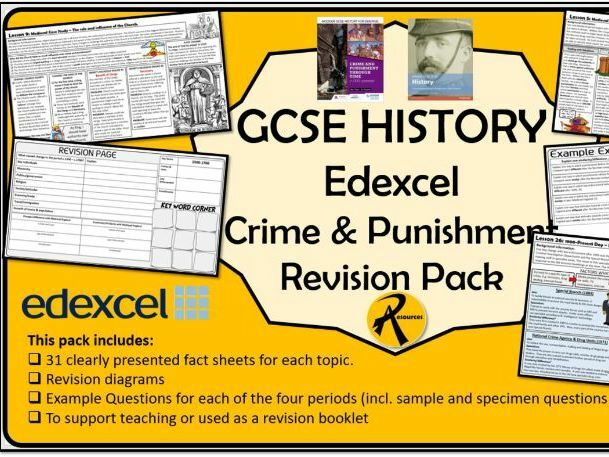 31 fact sheets for each topic needed for the Edexel 1-9 Crime and Punishment GCSE History Paper 1 unit. 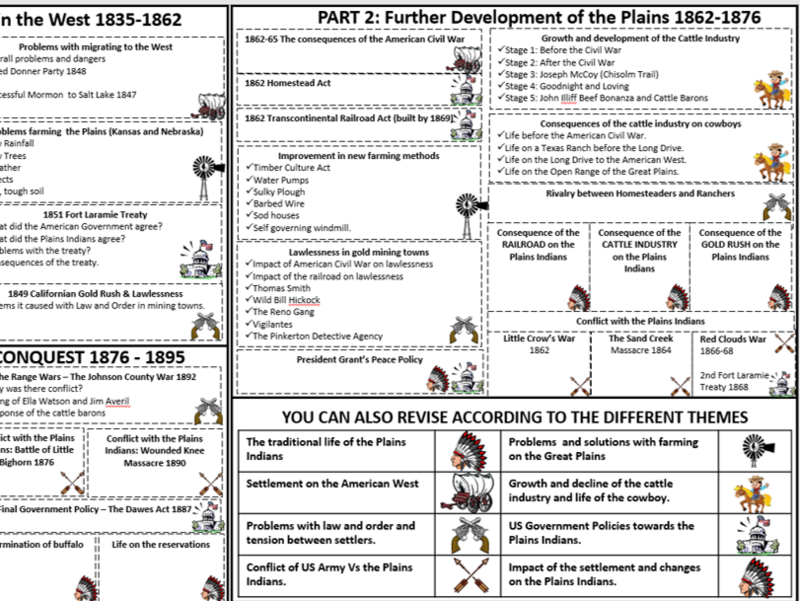 Each fact sheet can be copied into a revision booklet for your students. The amount of detail is high but key points are highlighted throughout for weaker students. Also included are 4x revision diagrams for each period of the study and 4 x example exam question sheets with sample questions from Edexcel’s specimin and sample papers. This will make a perfect revision booklet for the students as I find the revision workbooks currently available seem to lack some detail in key areas. Information has been taken from both Hodder and Pearson books to keep a balance. Please be kind enough t leave a review if you find this pack useful. I am about to start a differentiated version of this content so watch this space. This is a revision booklet for OCR Modern Worlds covering the Cold War from 1945-79. This is aimed at a wide-range of abilities, enabling students to bring together key words and important information in an accessible booklet. 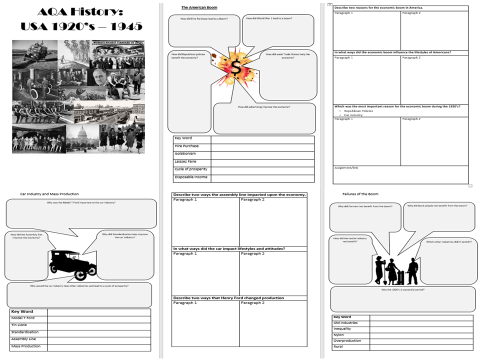 A 43 page booklet that recaps the AQA america topic from 1920-45. The booklet contains key word prompts, questions and tasks. I use this as a bank of worksheets to keep refreshing their understanding of the topic. When it comes to their exams students can print these off for revision. Revision booklet with detailed timeline, helpful tips to layout revision and exam questions! A revision game for History of Public Health GCSE topic, students use this to recap topic and break up a lesson. Revision aid to complement the previous deadline game which covered the Weimar years. 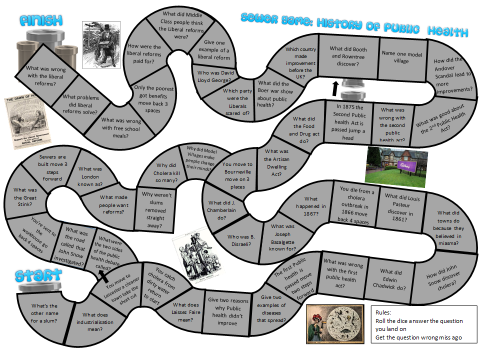 A handy resource for revision, contains board game template, question cards which can be printed out for the course covering all periods - Roman to 20th century - and some blank ones for students to create their own questions. Based on the OCR specification but can be used for anyone studying the SHP topic. Revision Monopoly game for year one content (AS Level) on the English Revolution. Covers the period 1625-1642. This is a useful game for revising key information relating to the breakdown between Crown and Parliament, Personal Rule and the Crisis of Parliament. Rules are included on the board. This follows the basic structure of monopoly: if a student lands on an owned property they must pay the owner - double the amount if they get the question wrong. Chance cards could either gain them tokens or mean they have to pay up. Once questions have been used, ‘property owners’ must come up with new questions relating to their topic. Get out of Jail by either rolling a double OR by correctly spelling a key word (e.g. Presbyterian). 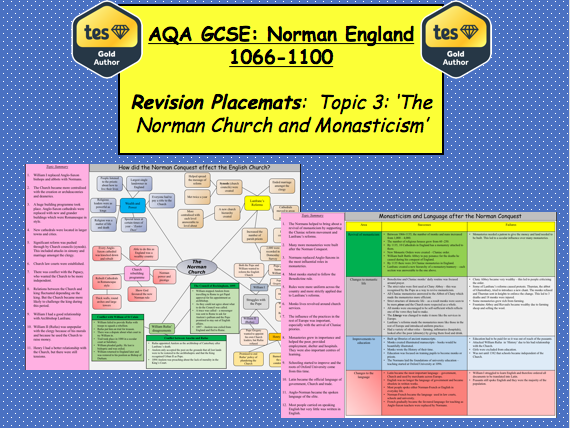 A Level students use template to develop board for year two content (1642-1660). 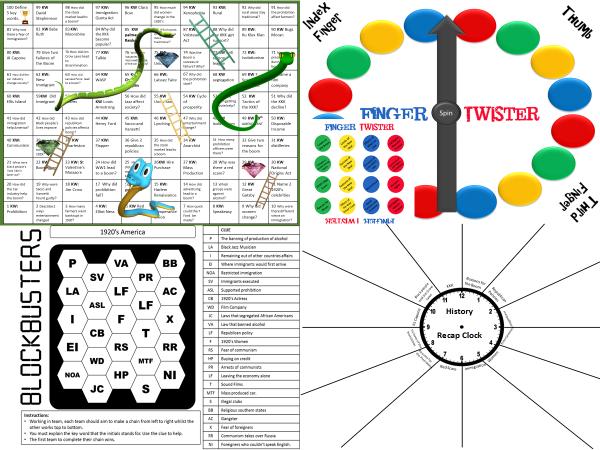 With thanks to Jade Booth for the board game template and Mosley for initial template. This is a very useful resource to help students structure their revision for an end of unit assessment or their final exam in June. It has been organised Chronologically but also thematically. My students have found this useful as an alternative way to revise. Students can have the option of colour coding each theme for revision. I would suggest enlarging to A3 if possible. Please note that this is a single sheet resource, but due to the time it took to produce this, I hope this reflects the asking price for it. Hopefully it can last you many years. Fear and Terror (Gestapo/SS) , Propaganda, Censorship, Legal System, DAF, Education, Youth Groups etc.